The statutes of the LORD are true, all of them just; more desirable than gold, than a hoard of purest gold. In his massive book, The Future of Life, naturalist Edward O. Wilson describes a fascinating battle between two species of ants. Red ants attack black ants. Despite the black ants’ efforts to fend off the aggressors, the red ants carry off egg cases from the black ant colony. When, back in the red ant colony, the black ant eggs hatch, the hatchlings behave as though they are part of the red ant colony and do the work that red ants would otherwise be doing. Do you see what’s going on here? The red ants have effectively conducted a slave raid on the black ants, and they have made the black ants their unwitting slaves and prisoners. Are we to condemn the red ants for acting as they do, for racism, for violence, for reducing other ants to slaves? Of course not! Ants are not subject to moral laws. They are subject only to physical laws, and the only law they can be said to “obey” is that which dictates the survival of the fittest, the strong surviving at the expense of the weak. In nature, at least in fallen nature, might makes right, and all that matters is the survival of the fittest. Mother Nature recognizes no morality. We humans, however—and this is what sets us apart from all other animals—we humans have been given the Natural Law, the law of God written in our human nature, on the human heart, as Saint Paul says. Thus we know, for example, that we are to do good and avoid evil, that taking a human life is more serious than taking the life of a chicken, that sexual activity needs somehow to be regulated, that we have a duty to preserve our own life and the lives of our family members. This Natural Law, this law of human nature, can be found in all cultures, at all times, and in all places. Take any two five-year-olds. Give one a large piece of cake and the other a very tiny sliver. The recipient of the smaller piece will invariably exclaim, “Hey, that’s not fair!” Where did this universal idea of fairness come from if it were not written in our human nature? Each man is at every moment subjected to several different sets of law but there is only one of these which he is free to disobey. As a body, he is subjected to gravitation and cannot disobey it; if you leave him unsupported in mid-air, he has no more choice about falling than a stone has. As an organism, he is subjected to various biological laws which he cannot disobey any more than an animal can. That is, he cannot disobey those laws which he shares with other things; but the law which is peculiar to his human nature, the law he does not share with animals or vegetables or inorganic things, is the one he can disobey if he chooses. This law was called the Law of Nature because people thought that every one knew it by nature and did not need to be taught it. They did not mean, of course, that you might not find an odd individual here and there who did not know it, just as you find a few people who are colour-blind or have no ear for a tune. But taking the race as a whole, they thought that the human idea of decent behaviour was obvious to every one. And I believe they were right. If they were not, then all the things we said about the war were nonsense. What was the sense in saying the enemy were in the wrong unless Right is a real thing which the Nazis at bottom knew as well as we did and ought to have practised? If they had had no notion of what we mean by right, then, though we might still have had to fight them, we could no more have blamed them for that than for the colour of their hair. I know that some people say the idea of a Law of Nature or decent behaviour known to all men is unsound, because different civilisations and different ages have had quite different moralities. But this is not true. There have been differences between their moralities, but these have never amounted to anything like a total difference. If anyone will take the trouble to compare the moral teaching of, say, the ancient Egyptians, Babylonians, Hindus, Chinese, Greeks and Romans, what will really strike him will be how very like they are to each other and to our own. Some of the evidence for this I have put together in the appendix of another book called The Abolition of Man; but for our present purpose I need only ask the reader to think what a totally different morality would mean. Think of a country where people were admired for running away in battle, or where a man felt proud of double-crossing all the people who had been kindest to him. You might just as well try to imagine a country where two and two made five. Men have differed as regards what people you ought to be unselfish to—whether it was only your own family, or your fellow countrymen, or everyone. But they have always agreed that you ought not to put yourself first. Selfishness has never been admired. Men have differed as to whether you should have one wife or four. But they have always agreed that you must not simply have any woman you liked. For those of us who belong to the Judeo-Christian tradition, the clearest written expression of the Natural law is the Ten Commandments. In other words, the Ten Commandments are written testimony that human beings are a cut above the merely natural world. Without the Natural Law, without the Ten Commandments, we would be hard-pressed to defend the proposition that racism is wrong, that rapacious violence is wrong, that murder is wrong, that slavery is wrong, even that Hitler was wrong! All of the aforementioned horrors could be justified as manifestations of the survival instinct, as means to the survival of the fittest, to the strong overcoming the weak. Without the Natural Law, we would be no better than ants. All that would matter is the survival of the fittest, and those who happen to be the strongest or the loudest would get to call the shots. Our obedience, then, is either to the Natural Law, the law of good and evil put into us by God,, or else it is to the dictum that might makes right. Are we going to resemble human beings or ants? Alas! One look at our nation’s political landscape would seem to indicate that we are behaving more like ants than human beings. As a result, our country seems more fragmented than it has ever been before with the exception of the Civil War (or, if you prefer, the War Between the States). If we continue on our present course, the result will be disaster. Jesus and President Lincoln remind us that “A house divided against itself cannot stand.” Are we without hope? I do not think so. To illustrate what I mean, let me tell you about the Japanese art form known as kintsugi. When a ceramic or porcelain vase is broken, the Japanese do not simply discard the shattered remains. They repair the vessel with glue or resin containing gold dust, hence the name kintsugi, which literally means “gold joinery.” The resulting vessel is often very beautiful, even lovelier than the original. There are actually some individuals who deliberately break brand-new pieces of pottery and then gold glue them back together again for the purpose of bringing about the kintsugi effect! The idea is that brokenness is not something to be covered up or denied but rather to be embraced and transcended as part of the vessel’s history. As I said earlier, our country seems to be hopelessly divided. What I would like to see is a Kintsugi Coalition, people coming together in this nation to rebuild a fragmented America. The Japanese repair broken vessels with glue laced with gold dust. What glue can we use to rebuild our shattered country? Why not the Golden Rule? For Christians, the Golden Rule can be found in Matthew 7:12. Jesus says, “Do to others whatever you would have them do to you. This is the law and the prophets.” Variations of this bit of the Natural Law have been found in all cultures and at all times. The ancient Chinese, Egyptians, Indians, Greeks, and Romans all had their own versions of the Golden Rule, and the same holds true for modern religions. We need to start doing to others as we would have them do to us. As I see it, there ought to be two guiding principles of the Kintsugi Coalition. Principal #1: the Good Lord gave us two ears and only one mouth, and we should use them accordingly, being willing to listen twice as much as we speak. The willingness to listen speaks volumes. (That, by the way, would make a great T-shirt slogan.) Principle #2: when we do speak, we should, as far as possible, refrain from name-calling, pejorative labels, and abusive language. Such verbiage accomplishes nothing positive. It is, on the contrary, worse than a filthy scalpel. Far from bringing about healing, it only causes wounds that inevitably become infected with resentment. In our fragmented country, we can choose to act either as warring ants or rational human beings. 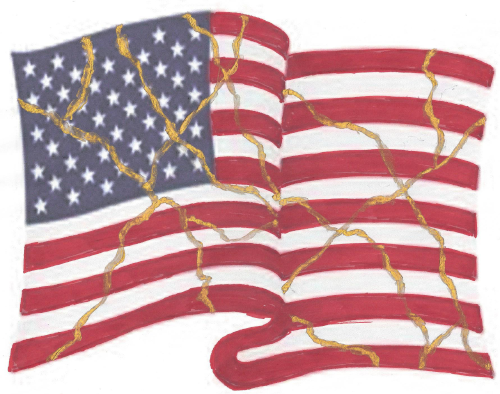 If we take the latter course, the best kintsugi glue we can use to unite our divided nation is the Golden Rule. We must do to others what we would have them do to us. First and foremost, we must be willing to listen twice as much as we speak (or tweet). Second, when we do speak, we must at all costs refrain from name-calling and abusive labels. Let us go forth and start building the Kintsugi Coalition, whether it be at home or at work, in face-to-face encounters or on Facebook. Let’s begin acting like rational human beings instead of impulse-driven ants. A kintsugi bowl, if I understand correctly, is strongest in the very places it has been mended. Likewise, no friendship is firmer than that between former adversaries. Who knows? Our nation may one day turn out to be a mended vessel of extraordinary strength and beauty. Mere Christianity, Book I, Chapter 1. Mark 3:25. Abraham Lincoln delivered his so-called “House Divided Speech” on 16 June 1858.